bl.uk > Online Gallery Home	> Online exhibitions	> Asia, Pacific and Africa Collections	> Trinity Church [Karachi]. 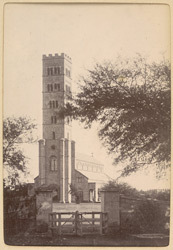 Photograph of the Trinity Church in Karachi, showing its distinctive tall, square tower, taken by an unknown photographer, c.1900, from an album of 46 prints titled 'Karachi Views'. Karachi, once the capital of Pakistan, is now the capital of Sindh province and the major port and main commercial centre of the country. It was a strategically located small port (Kharak Bunder) at a protected natural harbour on the Arabian Sea north-west of the mouth of the Indus, and was developed and expanded by the British, when they took over Sindh in the mid-19th century, to serve the booming trade from the Punjab and the wheat and cotton regions of the sub-continent. Trinity churches were built by the Trinity Board along the coast of England from the mouth of the Thames to Portsmouth as well as in British India. The churches served as lighthouses by having beacons installed on their towers, in return for which they were provided with funds. Trinity Church, constructed between 1852 and 1855, was the first major church in Karachi. It was designed by Captain John Hill of the Bombay Engineers. Its square tower rose to about 250 ft and so made a suitable lighthouse and landmark for vessels approaching Karachi harbour. In 1905 when the foundations showed signs of weakness, the tower's upper portion was reduced and it is now 110 ft tall.